Grill: 400 indirect flame, skin-side down, covered for 10 min per inch thickness. Remove fillet from the heat and allow it to rest for 4 minutes before serving. Pan Sear: In a hot lightly oiled skillet, sear the flesh side for 5 minutes until flesh lifts easily and then flip once. Cook on skin-side down covered for an additional 5 minutes or more depending on the thickness. 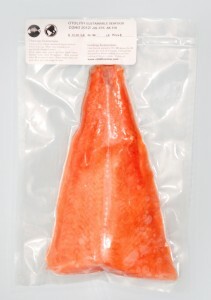 Total cooking time should be no longer than 10 minutes per inch of thickness for thawed fillet. Coho is an excellent weekly dinner staple. It is fast and easy to prepare, tastes wonderful served with brown or wild rice and provides a beauitiful contrast alongside any green seasonal vegetable. 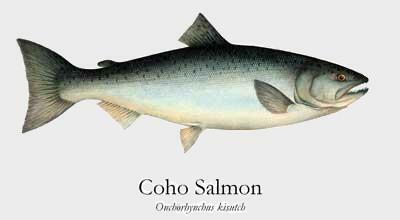 Coho is a wonderful alternative to King salmon when making your own sushi. Its rich mild fatty flavor goes well with almost any other sushi ingredients and it adds a necessary bright orange color to any sushi palet.